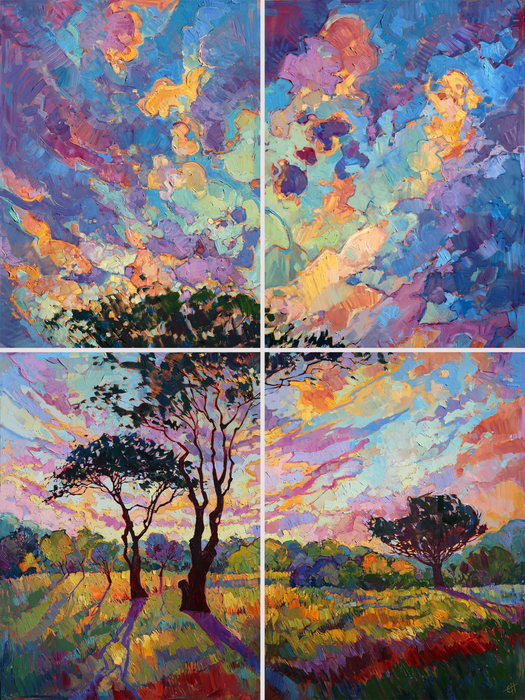 Hanging precariously and horizontally from red sandstone, fifty feet above the ground, may not seem like it would inspire the creation of beautiful oil paintings, but that is exactly what happened with Erin Hanson. Hanson’s thirst for adventure and love for art has been evident from a young age. Growing up in a family of Boy Scouts, Hanson’s favorite memories as a child were camping and backpacking in beautiful landscapes around California. Painting on an easel constructed by her father while in elementary school, Hanson worked to enhance her skills across many mediums including pastels, murals, oils and watercolor under the watchful eye of her mentor and always supportive family. Hanson was accepted into a special scholarship program in 1997 at the Otis College of Art and Design. Taking pause from her artistic passion to pursue her ongoing fascination with the world of science, Hanson graduated from UC Berkeley with a degree in Bioengineering in 2003. Clearly armed with the grit and determination to take on any ambition, Hanson reconnected with the world of art through her love of nature and adventure. 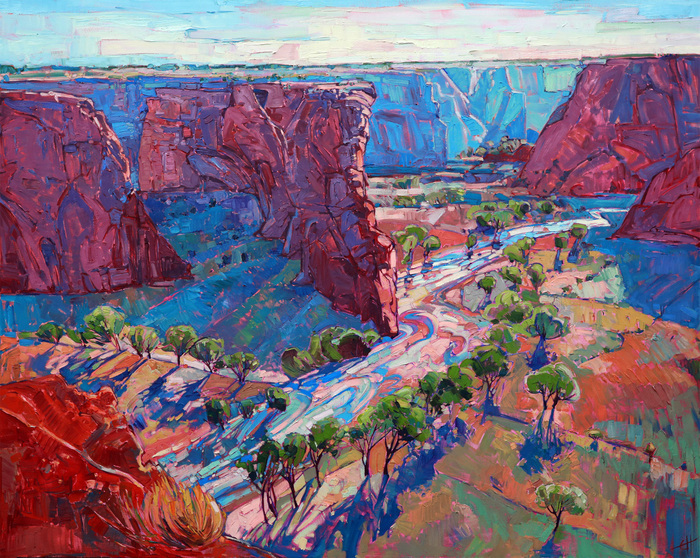 Immersing herself in the red rock of Nevada and exploring the rugged terrain of the Wild West reinvigorated her desire to recreate the beautiful sites with powerful oil paintings. Hanson has rapidly emerged as a must-watch for art and nature lovers worldwide. 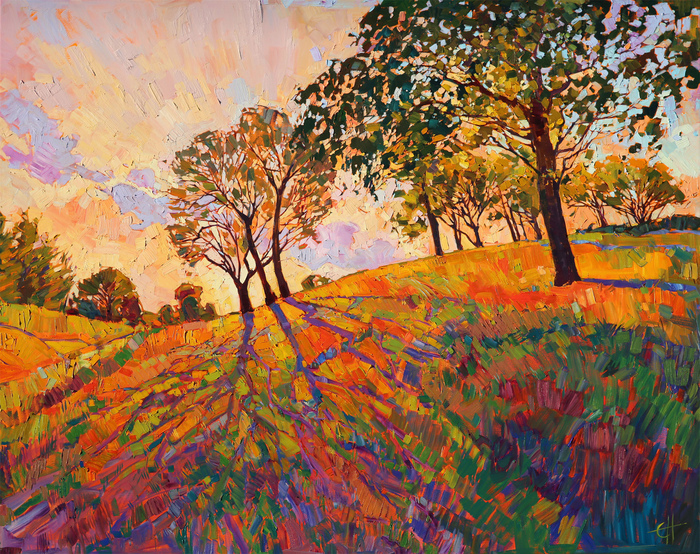 Her eye for passionate color and invigorating take on landscape has earned her a steadfast fan-base and loyal collectors that await with baited breath to see what she will paint next. 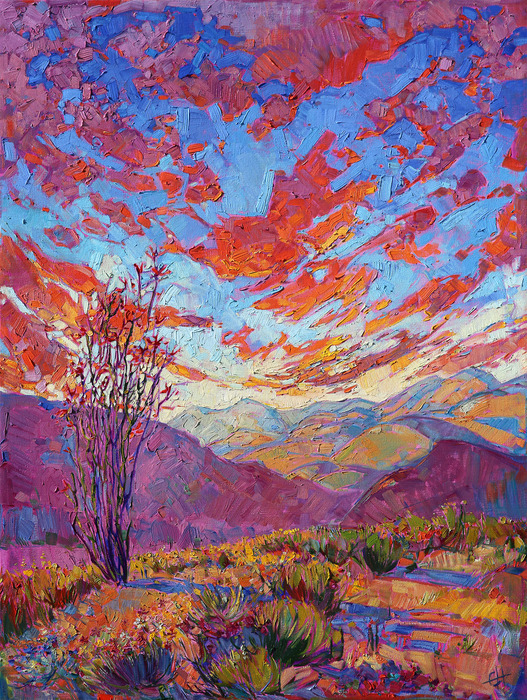 Open Impressionism, the signature style of Erin Hanson, can be recognized by the loose brushwork, emotional color, and unique, non-layering technique with oils. Expressive brush strokes stand out from the canvas, creating a moving mosaic of color and texture. Crystal light sparkles through the trees, casting dramatic shadows across the hills. The warm, inviting colors of the afternoon sky are interspersed with cool lavender and green. The smoke tree is one of the California desert's most beautiful plants. The pale, frothy fronds turn color like fire to smoke at the right time of year. The brush strokes in this painting are loose and impressionistic, creating a painting full of texture and color. Vibrant colors and abstract shapes dance through this large painting, the sky stretching high above the hills. The brush strokes in this work are loose and free, conveying an emotion of wide open space. 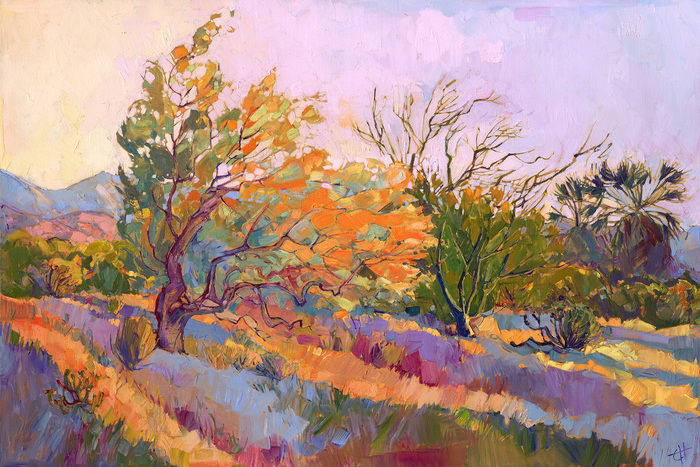 Thick brush strokes and bold color make this landscape of central California pop with life and movement. 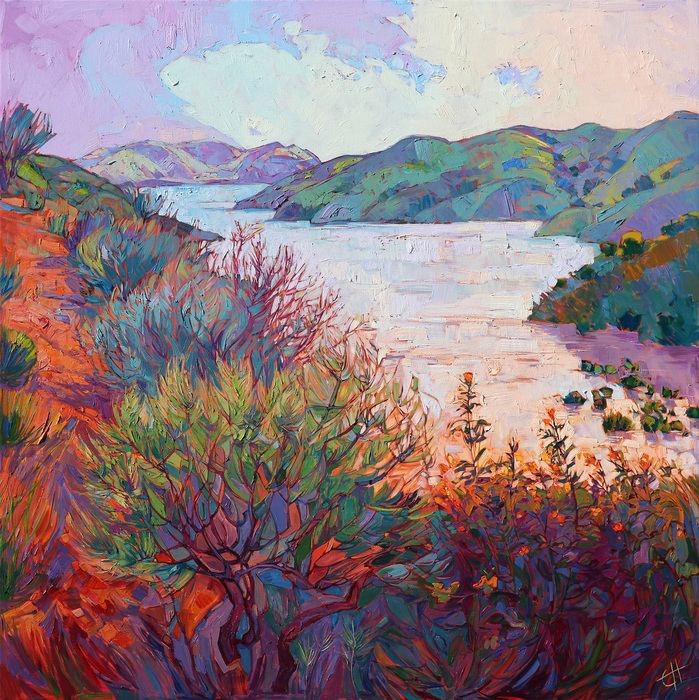 This painting of Whale Rock Reservoir, near Paso Robles' wine country, brings to your home the delicate light of dawn in lavender curves and distant green hills. Vivid color and loose brush strokes capture the beauty of a setting sun across the layered mountains of Borrego Springs, California. The tall, graceful ocotillo stands boldly in the foreground, its long limbs blooming with heavy red flowers. The desert in bloom is one of the most beautiful sights in California. The lush valley floor of Canyon de Chelly is covered in spring green cottonwoods, following the winding river waters. This painting brings the drama and beauty of the red rock desert to your home.